A children’s play center in Melbourne, Australia, took the hassle out of finding a babysitter before a night out. BASE Camp Kids launched a series of date nights last year, giving parents an opportunity to enjoy a fine dining experience while their children are supervised nearby. 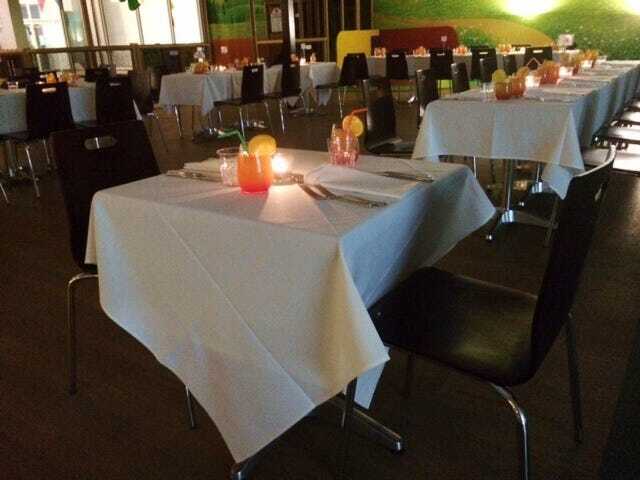 The staff transform the cafe area of the indoor play center into a restaurant complete with white tablecloths, tealight candles, and soft background music. For $55 per adult, the camp offers a gourmet three-course meal, “mocktails,” and table service from 6:30 to 9 p.m. Owner Lelen Kemke came up with the idea after she realised how difficult it was for parents to find good babysitters. “I realised that there were people who might find it hard to get babysitters or didn’t feel comfortable leaving their kids with a babysitter, but who still wanted a fine dining experience,” she told Daily Mail Australia. The menu includes healthy yet refined items like seafood paella, salmon, a rack of lamb, and panna cotta. While parents eat, their kids enjoy dinner, ice cream, and a movie in the workshop rooms for only $8. The play equipment is closed to maintain a serene ambiance in the dining area. The date nights have been so popular that they are now being held monthly.